Synopsis: The next generation of shape-shifting dragons from the popular author of the Dragonfire novels. Be sure to check back tomorrow for an interview with Deborah Cooke! Review: 4 Stars - Author Deborah Cooke has written a new generation, a younger generation within the world of her adult Dragonfire series novels with a trilogy in the Young Adult genre – The Dragon Diaries. 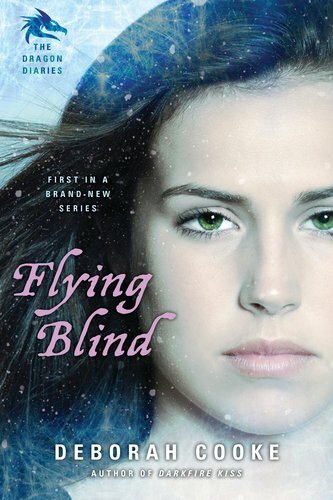 Flying Blind is the first book introducing the YA world to her younger Pyr characters, the dragon shape shifters who live among humans in a world not much unlike our own. Zoe is a special kind of Pyr. She’s the only female of their race. She’s a Wyvern, and has special powers to help her one day lead the whole of the Pyr race. The only problem is, her powers, including shifting into a dragon aren’t playing nice. She can’t seem to figure them out and it’s frustrating for her in more ways than one. When something happens and she taps ever so slightly into her Pyr powers – her father, the current head of all the Pyr, sends her along to a boot camp with her friends – other teen Pyr in the hopes that she’ll be able to learn more of what her powers are and how to be able to command them at will. When trouble hits it’s up to Zoe and new friend Jared to get the others on board to save other Pyr that are in danger. And I just have to mention that I loved Jared. He might not be in the story all that much, but he’s a huge key part of things to come. I’m hoping we get to see more of him in the next two books. This was a great start to the trilogy. Zoe is dealing with more than what a normal teenage girl has to deal with, but Cooke has done a great job in making sure that many real issues that teenage girls have to deal with are also there for Zoe. She might be able to shift into a dragon and has amazing powers, but she’s a teen girl who has dreams and crushes and worries just as any other girl does. I liked the different sides of Zoe we get to see and learn about while reading. The lists she makes to figure things out showed a serious side to her and a need for understanding. This was a nice balancing act to make her seem older when her sometimes younger side comes out. The guys around her, all the other teen Pyr’s were hard to get to know… for the reasons why, you’ll have to read the book to find out. However, I’m sure we’re bound to learn more about them in the next two books. The bits and pieces of myth that we learn along the way were great, but I wish there was more. I loved how Jared had knowledge when Zoe needed it and was willing to help her out when others wouldn’t or more so couldn’t. His part of the story for me was like unlocking secrets for not only Zoe, but for the reader as well. All in all, I really enjoyed Flying Blind. Cooke’s dragon shifters are unique and extremely interesting, while her story kept me entertained and ready to read more. With characters that grow on the pages before your eyes, I’m more than looking forward to reading the next two books in the Trilogy. Winging It – book two is set to be released December 2011, with the 3rd book to follow soon after. If you are a fan of dragons or are looking for a great new take on them be sure to pick up this book soon. Although this isn't my type of book, it sounds like it would be interesting and the characters a bit complex. This one looks quite good and is actually on my wishlist. I'm looking forward to reading it! Thanks for the great review. Great review! I'm not entirely sure this book would be right for me but I'm always looking for something unique to try and you made it sound pretty good so I'll try to keep an eye out for it!